People are often unreasonable, irrational, and self centered. What you spend years creating could be destroyed overnight. If you find serenity and happiness, others may be jealous. It was never about them anyway. This framework is how I endeavor to live my whole life. Kind, loving, creative, and happy, regardless of anything anyone else does in response. Because it’s not about them, it’s about me- my relationship with myself and with the divine. That’s all that really matters at the end of the day. The main criticism of “always choosing love” is that it is naive to believe anything other than “love hurts.” And you know what? Sometimes you do get hurt. But it’s better than the alternative for three reasons. First, if you lock your heart away you’ll lose it for certain. (I think that might be a line originally from Pirates of the Caribbean? But I love it so much that I’ve incorporated it fully into my own philosophy. Pirate till the end, I suppose.) This is a fairly obvious point. The only way to not choose love, is to choose not love. To choose to lock your heart away. And if you lock your heart away; if you bury it in a chest on an island where not even you can feel it because the pain of lost love is too much to bear, then you have lost your heart. And heartless is the last thing anyone should want to be. But this actually goes deeper. Because, secondly, there’s a huge difference between naivety and conscious decision making, and the difference is “choose.” The verb in this phrase is not love. I’m not advocating that we all just try and love love love all the time, frolicking through a sunny field of roses and bubbles. That’s naivety. Believing that that is even a possibility is naivety. Because life is much harsher than that. As Wesley points out in The Princess Bride, “Life IS pain…Anyone who says differently is selling something.” But, maybe we need to continually sell ourselves on the redeeming parts of the world, like realtors pointing out only the good bones of a dilapidated house to potential buyers, which is effectively pointing out that they could choose to make the place better. Maybe we need to continually remind ourselves to choose love; to choose to make this place better. The keyword is choose though. When you choose love, it is an inherent recognition that there are other options out there, and they are not as worth choosing. You could choose the easy way. You could choose to lock your heart away, to always choose the fast and cheap and mindless thing that “feels good” in the moment. You could choose that. We all could. Just as in the archetypal hero’s myth, the knight could choose to cower in his hut, and hope that the dragon gets bored and moves on and doesn’t destroy the village. We could all choose the effortless. But, the thing is, the meaning is in the effort. Realistically, the dragon is definitely destroying the village unless someone stops it. And so if you stay in your hut, you will almost certainly be destroyed. But the knight who choses to turn and face the dragon, knowing full well that he very probably might be destroyed in the attempt, recognizes that at least there is nobility in the attempt. And at best, you actually slay the dragon and keep it from destroying the entire village. That’s what makes you a hero, because the meaning of life is in the attempt to fully live. Yes, you might die if you face the dragon. You might get hurt so badly that you would rather die if you open your heart to love. And if you do either of those things unconscious of these truths, you’ll almost certainly be overwhelmed by your inevitable “failure.” But, once you’re conscious of the fact that you’re going to die anyways; that you’re going to get hurt anyways; that even if you love someone in a healthy marriage for 60 years, you’re both mortal; that if you lock your heart away you’ll lose it for certain, you understand that to take that risk is the only chance you have of living a full life. The entire hero’s journey story exists over and over and over again to remind us continually of this fact. That waking up to the reality of life and choosing the risky option (knowing that it is risky, but that it’s the best chance you have) is so much better, so much more meaningful, than never choosing anything at all. Love is a choice. Not just once, at the beginning, but always. Every single day. Every single important instance, if you want to have a successful relationship across time, you have to continually choose to love. Being “in love” is a feeling, and feelings are ephemeral. Love is choosing to love another flawed and sometimes terrible human, even when you no longer feel like it. Even when you’re no longer seeing them through rosy glasses. Even on the days when they infuriate you. Love is a choice, and it’s not an easy one. But, the easy things are often not worth it, and the things in life that are oh-so worth it are often not at all easy. Lastly, there’s something else that happens when you knowingly choose love - you give the person you’re choosing to love a chance to choose love too. You can extend your hand to another imperfect struggling human soul, knowing full well that they might lash out in return, and they might reject your offering of love, but the knowledge of that being a possibility (maybe even a probability) is what ultimately saves you from being overwhelmed by the sting of rejection if and when it happens. The knowledge that not everyone is as awake as you are will be your saving grace, because it will give you the enlightenment to see that this rejection, though it stings, is not about you. It’s actually about the inescapable pain the other person is in. You often can’t help them out of that. But you can love them in spite of it, and maybe if you’re lucky, you can even love them while they work themselves through it. So what are you going to do, not even try, because you know you might fail? Or worse, not even try because loving someone through something might be difficult, instead of effortless? No, of course not. You reach out anyway, safe in your own knowledge that even their rejection cannot swamp you. Choose love, my friend. Consciously. Fully aware that the person you’re choosing to love might not be even capable of reaching out to take your hand in return. Choose to reach out anyway. Let the knowledge of your conscious choice protect you from the sting of their hurts if they reject you. And even if they reject you, send them love and grace anyway. People are often unreasonable, irrational, and self centered. But by knowing that fully and making the conscious choice to reach out a hand in reconciliation and love anyway, you indicate to them that they have an opportunity to be better. You indicate that you believe in their ability to be and do better, which might be crucial. The people who need the most love are often the hardest to love, after all. And maybe that’s because they don’t believe themselves that they can be good enough; that they are even worth loving. Most of us don’t. But most of us want to be. And if you reach out your hand in love to someone who wants to be better, but doesn’t quite believe them self capable or worthy, yours just might be the little bit of belief they need to try. And you might be wrong. Maybe they can’t be the better person you hope they can be. In fact, very often, in my experience, you don’t get a hand of humble and graceful reconciliation in return. You do get burned. It’s risky business, this love stuff. Many people would say it’s a total crapshoot. And you know what, they’re probably right. One out of a hundred (or even higher) are not great odds. But they’re the only odds we have. Choosing love, fully conscious of the potential consequences, is the only chance we have. Might as well take it. The worst that can happen is that you wind up where you already are. And here’s the twist- the biggest challenge of them ALL. Harder than loving your family, your partner, or your friends, is loving yourself. Because we all know better than anyone else just how irrational, unreasonable, and self centered we ourselves can be. We’re the only ones who truly know our own darkest thoughts. So this is my ultimate challenge to each and every one of you. Not out of naivety, but out of fully conscious CHOICE, look at yourself- you unreasonable, irrational, beautiful mess of a human being- and choose to be kind to yourself anyway. Choose to reach out a hand in reconciliation with yourself. Choose to stop mentally beating yourself up at an excruciating level for all the minuscule ways in which you aren’t perfectly perfect every day. Choose to acknowledge that you’re not perfect, and that you’ll almost definitely fail another hundred thousand times in the future, and then choose to try again anyways. Show yourself that you do actually believe you can be better, no matter how many times you fail. Choose to love yourself anyway. It’s the only chance you’ve got. And then, once you choose to love yourself anyway, endeavor to always choose love - for your loved ones, your community, and the whole world. It’s the only chance WE’VE got. P.S. Care to take this a step further? Try this journaling exercise from the Starlight Journal (from the page where some of these artworks appear). Feel free to share your reflections in the comments, especially if this exercise resonates with you! 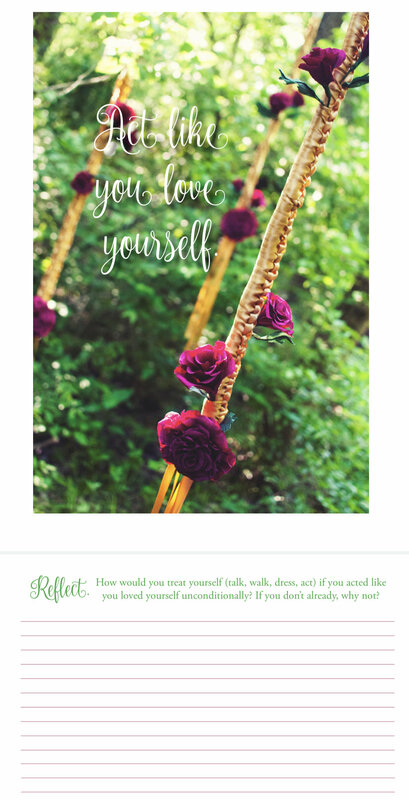 Reflect: How would you treat yourself (talk, walk, dress, act) if you acted like you loved yourself unconditionally? If you don’t already, why not?